Download "Update of LCI Background Data Exemplified for the German Steam Coal Supply Chain"
1 Update of LCI Background Data Exemplified for the German Steam Coal Supply Chain Oliver Mayer-Spohn, Markus Blesl, Ulrich Fahl, Alfred Voß University of Stuttgart, Institute of Energy Economics and the Rational Use of Energy (IER) Hessbruehlstrasse 49a, Stuttgart, Germany Keywords: Parametrised LCA, hard coal, steam coal, LCI data update ABSTRACT The quality of Life Cycle Assessment (LCA) studies substantially depends on the quality of the data used. Apart from the general availability of data it is of high importance to rely the process chain analysis on up-to-date data. This also refers to the background LCI data, which in this context are Life Cycle Inventory (LCI) data on the supply chain of materials, energy carriers or basic services as for example heat and electricity generation. This paper presents an approach for a standardised update of LCI background data based on the methodology of a parametrised Life Cycle Assessment. With parameters and fundamental coherences on material flows integrated in the process chain analysis, this methodology allows an easy and standardised revision of the central processes in the background supply chain by parameter variation. 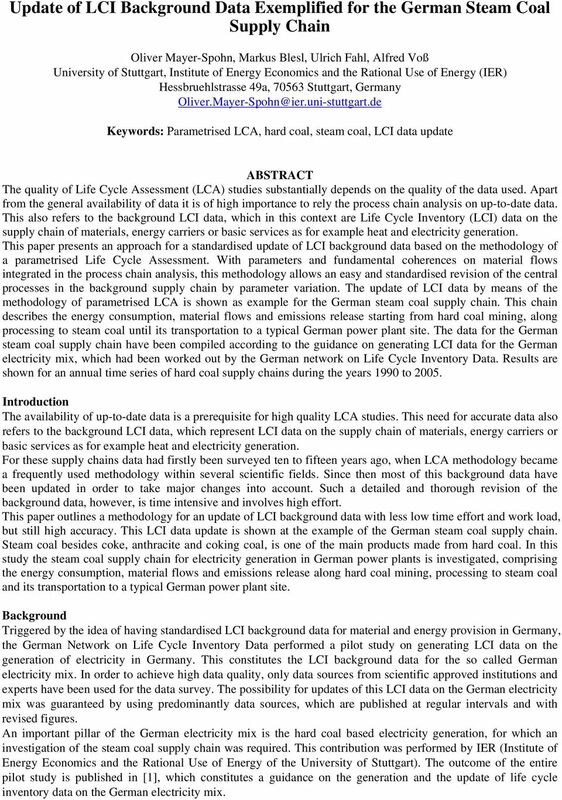 The update of LCI data by means of the methodology of parametrised LCA is shown as example for the German steam coal supply chain. This chain describes the energy consumption, material flows and emissions release starting from hard coal mining, along processing to steam coal until its transportation to a typical German power plant site. The data for the German steam coal supply chain have been compiled according to the guidance on generating LCI data for the German electricity mix, which had been worked out by the German network on Life Cycle Inventory Data. Results are shown for an annual time series of hard coal supply chains during the years 1990 to Introduction The availability of up-to-date data is a prerequisite for high quality LCA studies. This need for accurate data also refers to the background LCI data, which represent LCI data on the supply chain of materials, energy carriers or basic services as for example heat and electricity generation. For these supply chains data had firstly been surveyed ten to fifteen years ago, when LCA methodology became a frequently used methodology within several scientific fields. Since then most of this background data have been updated in order to take major changes into account. Such a detailed and thorough revision of the background data, however, is time intensive and involves high effort. This paper outlines a methodology for an update of LCI background data with less low time effort and work load, but still high accuracy. 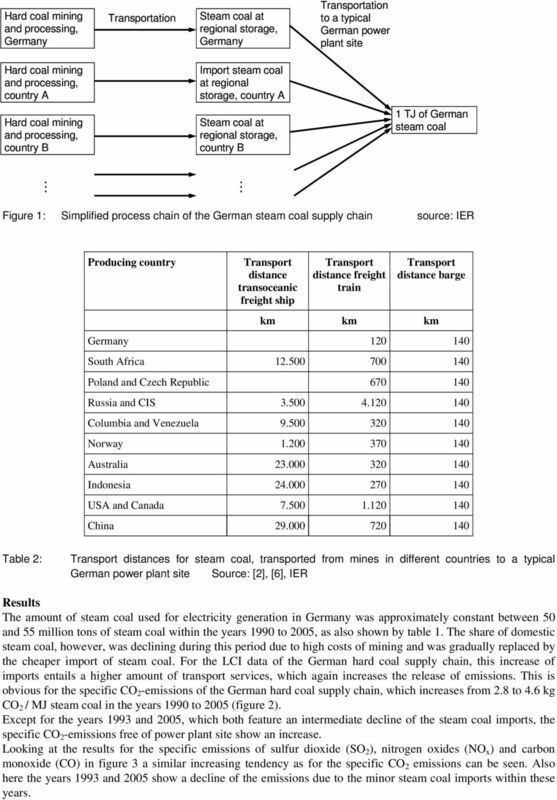 This LCI data update is shown at the example of the German steam coal supply chain. Steam coal besides coke, anthracite and coking coal, is one of the main products made from hard coal. 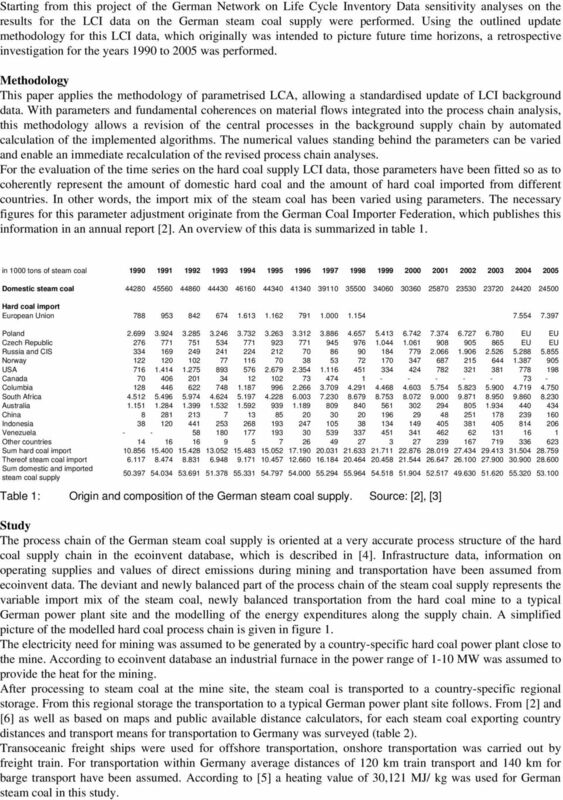 In this study the steam coal supply chain for electricity generation in German power plants is investigated, comprising the energy consumption, material flows and emissions release along hard coal mining, processing to steam coal and its transportation to a typical German power plant site. Background Triggered by the idea of having standardised LCI background data for material and energy provision in Germany, the German Network on Life Cycle Inventory Data performed a pilot study on generating LCI data on the generation of electricity in Germany. This constitutes the LCI background data for the so called German electricity mix. In order to achieve high data quality, only data sources from scientific approved institutions and experts have been used for the data survey. 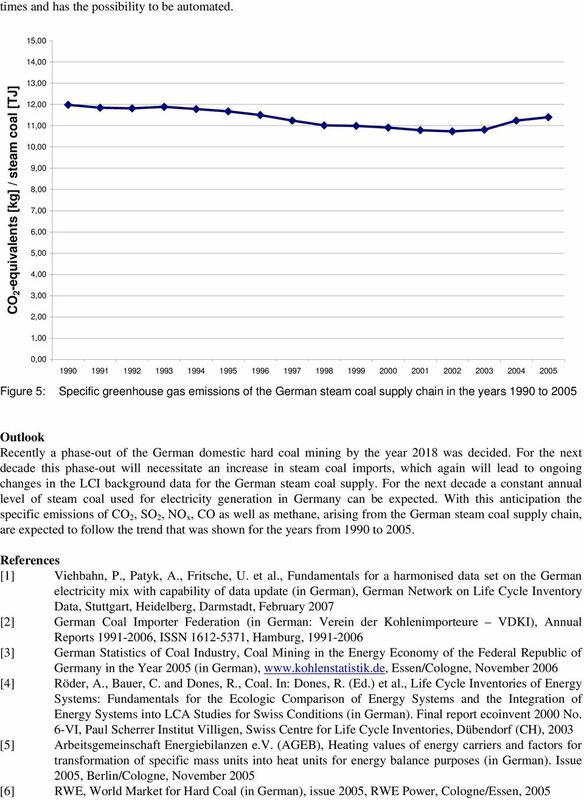 The possibility for updates of this LCI data on the German electricity mix was guaranteed by using predominantly data sources, which are published at regular intervals and with revised figures. An important pillar of the German electricity mix is the hard coal based electricity generation, for which an investigation of the steam coal supply chain was required. This contribution was performed by IER (Institute of Energy Economics and the Rational Use of Energy of the University of Stuttgart). The outcome of the entire pilot study is published in , which constitutes a guidance on the generation and the update of life cycle inventory data on the German electricity mix. 2 Starting from this project of the German Network on Life Cycle Inventory Data sensitivity analyses on the results for the LCI data on the German steam coal supply were performed. Using the outlined update methodology for this LCI data, which originally was intended to picture future time horizons, a retrospective investigation for the years 1990 to 2005 was performed. Methodology This paper applies the methodology of parametrised LCA, allowing a standardised update of LCI background data. With parameters and fundamental coherences on material flows integrated into the process chain analysis, this methodology allows a revision of the central processes in the background supply chain by automated calculation of the implemented algorithms. The numerical values standing behind the parameters can be varied and enable an immediate recalculation of the revised process chain analyses. For the evaluation of the time series on the hard coal supply LCI data, those parameters have been fitted so as to coherently represent the amount of domestic hard coal and the amount of hard coal imported from different countries. In other words, the import mix of the steam coal has been varied using parameters. The necessary figures for this parameter adjustment originate from the German Coal Importer Federation, which publishes this information in an annual report . An overview of this data is summarized in table 1. in 1000 tons of steam coal Domestic steam coal Hard coal import European Union Poland EU EU Czech Republic EU EU Russia and CIS Norway USA Canada Columbia South Africa Australia China Indonesia Venezuela Other countries Sum hard coal import Thereof steam coal import Sum domestic and imported steam coal supply Table 1: Origin and composition of the German steam coal supply. Source: ,  Study The process chain of the German steam coal supply is oriented at a very accurate process structure of the hard coal supply chain in the ecoinvent database, which is described in . Infrastructure data, information on operating supplies and values of direct emissions during mining and transportation have been assumed from ecoinvent data. The deviant and newly balanced part of the process chain of the steam coal supply represents the variable import mix of the steam coal, newly balanced transportation from the hard coal mine to a typical German power plant site and the modelling of the energy expenditures along the supply chain. A simplified picture of the modelled hard coal process chain is given in figure 1. The electricity need for mining was assumed to be generated by a country-specific hard coal power plant close to the mine. According to ecoinvent database an industrial furnace in the power range of 1-10 MW was assumed to provide the heat for the mining. After processing to steam coal at the mine site, the steam coal is transported to a country-specific regional storage. From this regional storage the transportation to a typical German power plant site follows. From  and  as well as based on maps and public available distance calculators, for each steam coal exporting country distances and transport means for transportation to Germany was surveyed (table 2). Transoceanic freight ships were used for offshore transportation, onshore transportation was carried out by freight train. For transportation within Germany average distances of 120 km train transport and 140 km for barge transport have been assumed. According to  a heating value of 30,121 MJ/ kg was used for German steam coal in this study. 3 Hard coal mining and processing, Germany Transportation Steam coal at regional storage, Germany Transportation to a typical German power plant site Hard coal mining and processing, country A Hard coal mining and processing, country B Import steam coal at regional storage, country A Steam coal at regional storage, country B 1 TJ of German steam coal Figure 1: Simplified process chain of the German steam coal supply chain source: IER Producing country Transport distance transoceanic freight ship Transport distance freight train Transport distance barge km km km Germany South Africa Poland and Czech Republic Russia and CIS Columbia and Venezuela Norway Australia Indonesia USA and Canada China Table 2: Transport distances for steam coal, transported from mines in different countries to a typical German power plant site Source: , , IER Results The amount of steam coal used for electricity generation in Germany was approximately constant between 50 and 55 million tons of steam coal within the years 1990 to 2005, as also shown by table 1. The share of domestic steam coal, however, was declining during this period due to high costs of mining and was gradually replaced by the cheaper import of steam coal. 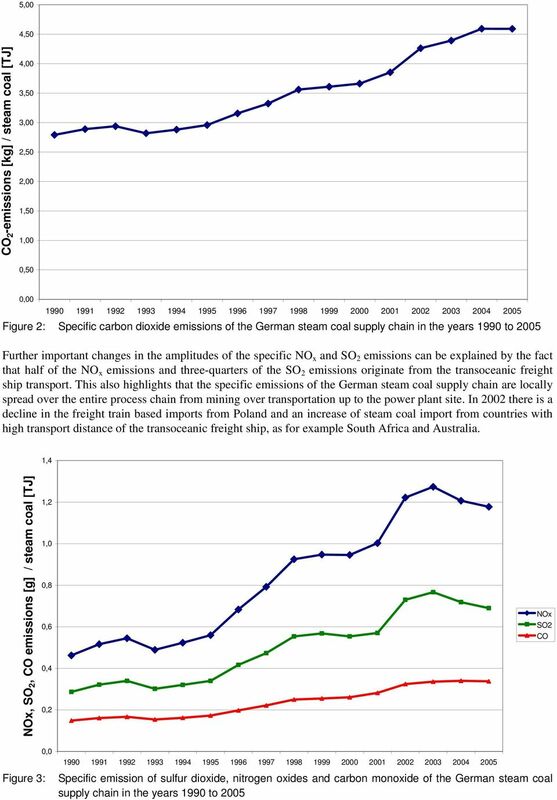 For the LCI data of the German hard coal supply chain, this increase of imports entails a higher amount of transport services, which again increases the release of emissions. 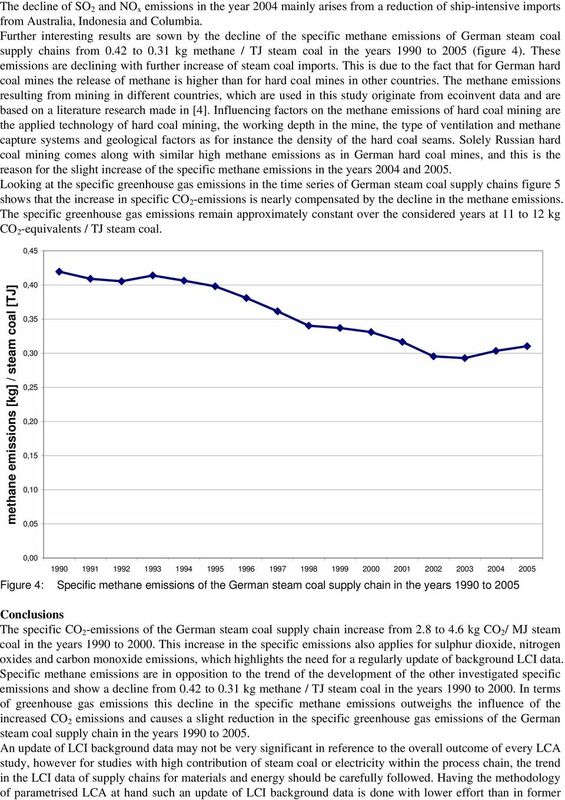 This is obvious for the specific CO 2 -emissions of the German hard coal supply chain, which increases from 2.8 to 4.6 kg CO 2 / MJ steam coal in the years 1990 to 2005 (figure 2). Except for the years 1993 and 2005, which both feature an intermediate decline of the steam coal imports, the specific CO 2 -emissions free of power plant site show an increase. Looking at the results for the specific emissions of sulfur dioxide (SO 2 ), nitrogen oxides (NO x ) and carbon monoxide (CO) in figure 3 a similar increasing tendency as for the specific CO 2 emissions can be seen. Also here the years 1993 and 2005 show a decline of the emissions due to the minor steam coal imports within these years. Greenhouse Gas Emissions Data Request Form. Resolved Example (Suppliers Case). Biomass Pellet Prices Drivers and Outlook What is the worst that can happen? Is fracking cracking the renewable industry? How big a threat is shale gas to renewables? A pound of coal supplies enough electricity to power ten 100-watt light bulbs for about an hour. ENERGY PRIORITIES OF THE POLISH PRESIDENCY OF THE EU COUNCIL: THE CZECH PERSPECTIVE Petr Binhack Energy Security as a Part of the EU Agenda Energy is an important precondition for European economic development.